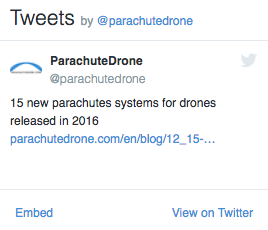 New FAA / ASTM F3322 regulations enable drones equipped with parachutes to fly over people. The new proposal released on January 14 would require drone operators to use a parachute certified F3322 by the ASTM Standard Authority. This new standard specifies the fabrication, design and testing requirements for drone parachute recovery systems. While it means more regulations, buying new gear, and more paperwork, compliance with this new regulation will also facilitate FAA approval to fly over people. ParaZero, a drone parachute manufacturer has been working on the standard with the development group, the FAA and other industry players thinks that it is "A big step forward for the commercial drone industry" and that it "will pave the path for safe and legal flight over people". The testing are thorough, it involves testing 45 functionalities (and as many test deployments) in 5 different failure scenarios. These test aims to determine if the recovery system is good at detecting the fall, triggering the parachute, inflation speed of the canopy and vertical speed upon impact. An interesting point of this F3322 standard is that it requires an automatic deployment of the parachute whereas in some other countries the parachutes must be manually deployed and local aviation authorities tends to trust more the human than the computer. The reality is that computer are almost always faster to detect a free-fall or failure than a human watching his drone from a few hundred meters away. Automated trigger systems detects the slightest anomalies in milliseconds and can immediately deploy a parachute at 150 km/h. The new standard should allow civil aviation authorities to decide if a recovery system is safe enough to allow flight over people. Before this new regulation professional drone operators could already fly over people but needed to apply for a waiver from the FAA. The certifications based on the new standard should let regulators to give the go-ahead quicker. And this in turn would facilitate the work of US based drone operators and grow the industry. As stated in the FAA Part 107 ruling, the waiver application must outline how an operator intend to safely conduct your proposed operation, including any additional risk mitigation strategies he may use. 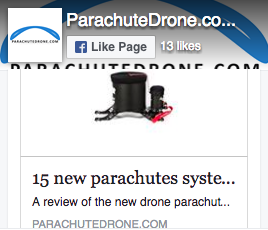 This will no longer be the case as long as your drone is equipped with an "ASTM F3322" compliant parachute. The test deployment are conducted on Griffiss International Airport which has been designated by the FAA as the official testing place. The NAUIR alliance manages this test site.